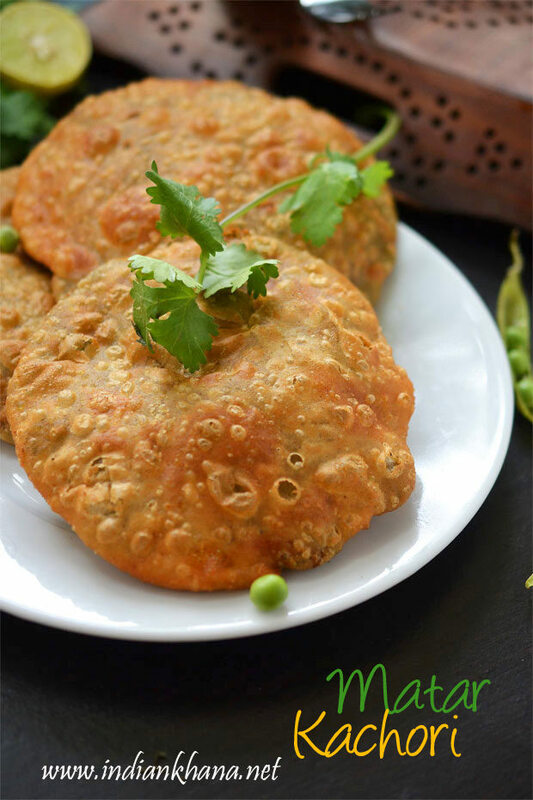 Matar Kachori, peas kachori or hare matar ki khasta kachori is flaky, crispy deep fried pastry filled with spiced peas filling and it's popular North Indian breakfast than snack during winter when there are ample of fresh peas in market. 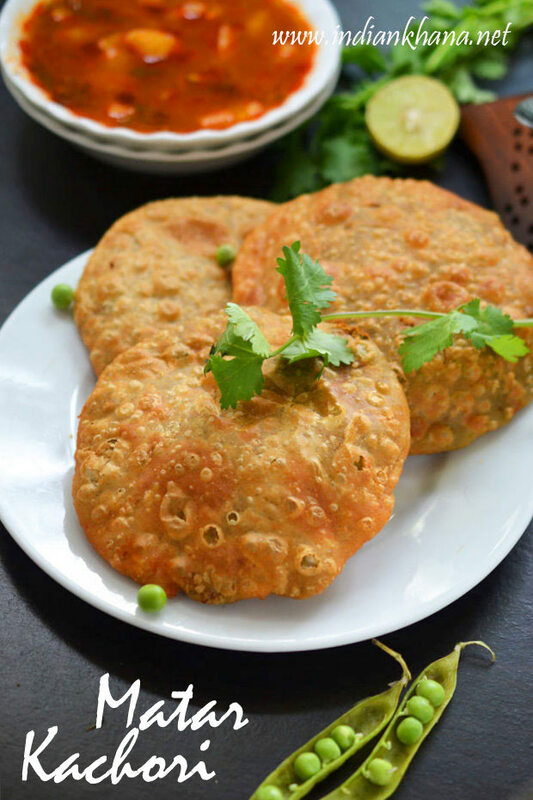 Matar Ki kachori is something which I relate a lot and since fresh peas is popular in our house along with the matar ki dal this matar kachori is another regular dish. Matar Kachori with aloo sabzi is the most famous combo and it makes great brunch deal during weekends. 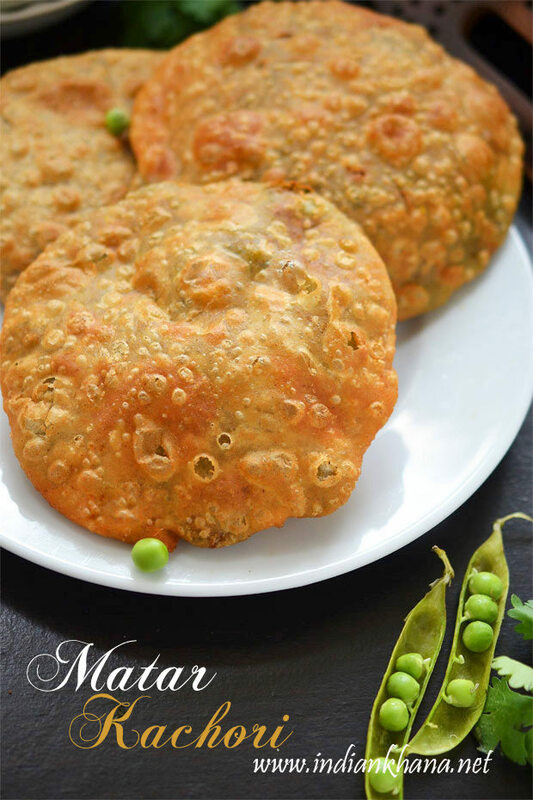 I wanted to post matar kachori for a long time but then getting fresh and good peas (matar) in Singapore is so difficult, though we get fresh peas but normally it's add dried and doesn't really look appealing to me, once in a while when I find some decent fresh peas then I get them without fail. And this time I got ample of peas and made various thing one of which is this matar kachori along with dubki wale aloo for my brother birthday. 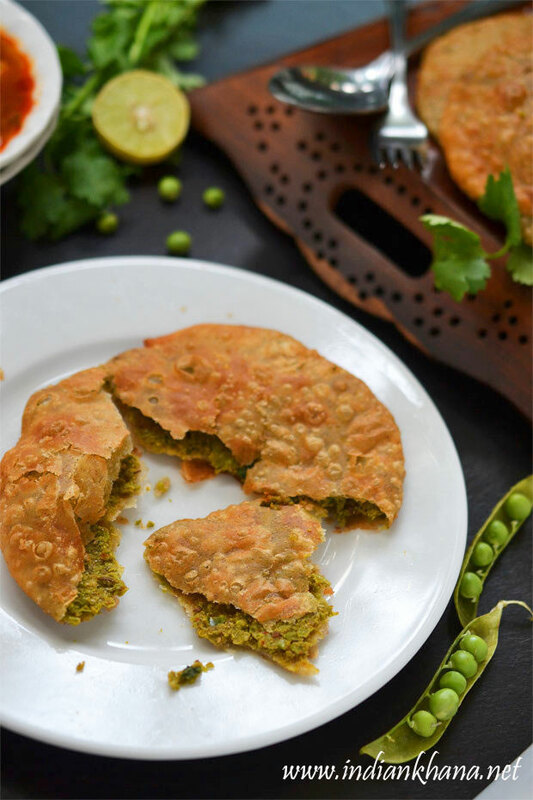 If you like kachori then you will like this peas kachori too it's flavorful and delicious plus the kachori was just melt in mouth with good crunch, such perfect kachori I made I was super glad that day, plus bonus I didn't use all maida but used half maida and half multi grain flour. There are various make of making matar kachori and this method is how it made in my home, there is also another Bengali Matar Kachori recipe which I shall try to post some time too. Khasta Matar Kachori where khasta means crisp and flaky and among all the various kachori recipes this one if my favourite along with moong dal kachori. You can make this for breakfast, brunch, lunch, evening snack or for any get-together, party though it seems like quite a work but once you start doing and organize yourself then it can be done with ease too. Enjoy the winter special until it last and make some matar kachori yourself, do remember to share your feedback. 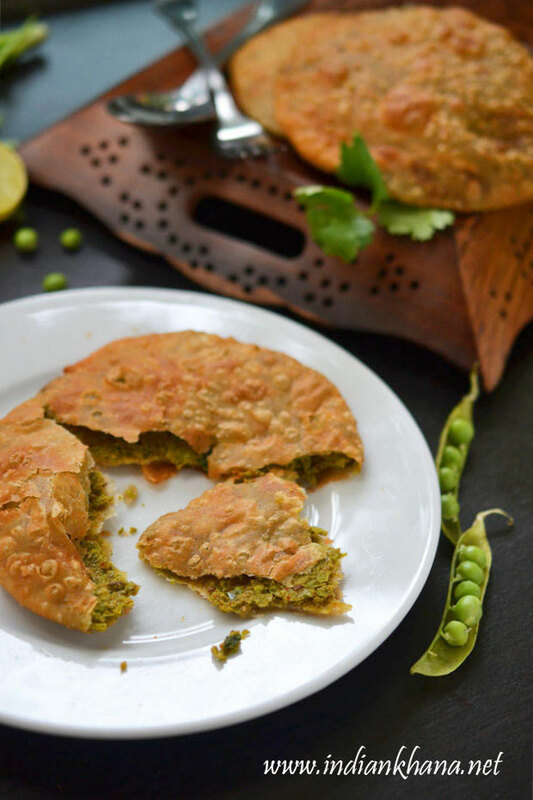 You can also check other Matar (Peas) Recipes here. For Dough - Sieve baking powder, salt, flour ( I used 3/4 Cup Maida and 3/4 Cup Multigrain Flour), add oil and mix well to combine everything, it will be like wet sand. Add water in small quantity and make soft and pliable dough. Cover with a damp cloth and keep it aside for half an hour or until needed. For Filling - Grind peas with ginger, green chili into coarse paste, do not add any water. Crush coriander seeds, cumin seeds and fennel seeds sightly. Heat 1 tbsp oil in a kadai or pan add hing, crushed coriander, cumin, fennel seeds and allow to cook for 30 secs, now add peas paste and mix well, cook for 6-8 mins in medium flame with regular stirring or until raw smells disappears. Add red chili powder, coriander powder, amchur, kala namak, salt and mix well to combine everything, cook for 3-4 mins or until peas paste is cooked well, add coriander leaves mix and off flame. Keep it aside for filling to cool down. For Kachori - Heat oil in kadai for deep frying. Take the dough and knead for a min again, divide in to 8 to 10 portions, take one pieces and roll into ball, flatten it to make poori. Add 2-3 tbsp of peas filling and bring all the egdes together to seal, roll to make a ball again, flatten it and roll in to medium size poori or any size that you prefer, do not make the kachori too think or too thick. Once the oil is hot gently slide 1-2 kachori and allow the kachori to puff up, gently flip it to cook another side, cook until both sides becomes golden brown. Keep flame in high while you wait for kachori to puff, after that keep flame in low or medium so it's gets cooked properly, do flip kachori in between as needed. Repeat same for rest of kachori. Serve hot or warm with dubkiwale aloo, aloo tari, pickle or curd. Or make it as great tea time snack. 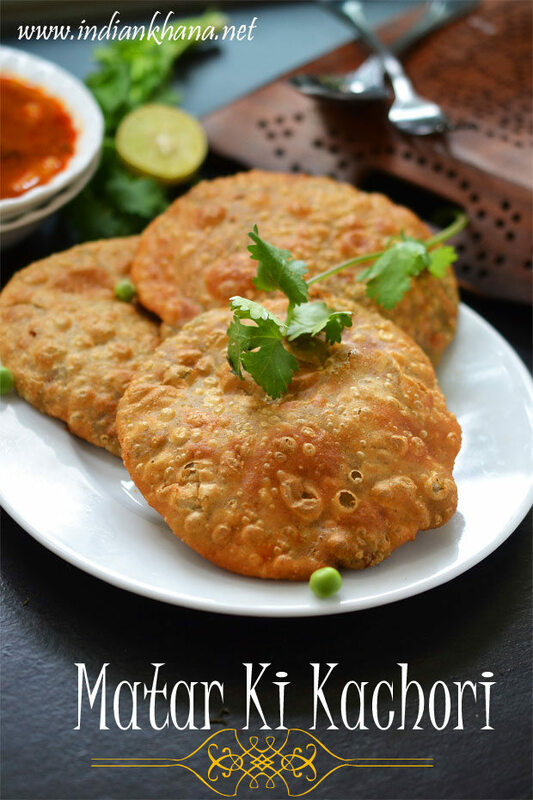 You can make this kachori with only maida or wheat flour or use half-half. Adjust the spices to your liking if needed. Don't keep the flame low for long time while frying, if the oil is not hot enough, kachori will start to soak lot of oil. After filling roll the kachori gently to avoid any breaks. 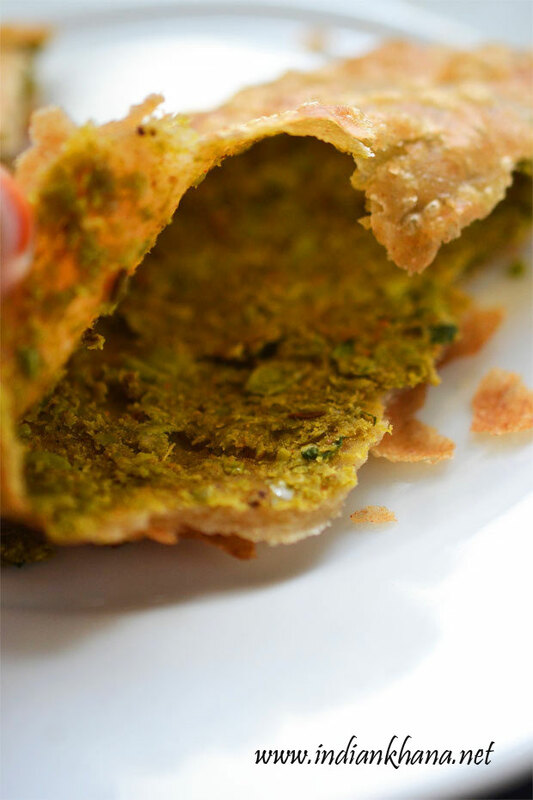 Delicious, all time favourite Matar Kachori - yum !